A short 30 minutes from Center City, Philadelphia is where the hamlet of Glenside, PA resides. A cozy suburban town, it is also the home of Arcadia University, a private college that was established in 1853. One can sense the grandeur of its trademark building, Grey Towers. See for yourself! The magnificent Grey Towers castle. Kailey Tedesco addressing the crowd prior to the reading. Kailey reading "Up from the Salt Cellar"
After a well-deserved round of applause, the staff of April Gloaming Publishing walked to center stage and a Q&A occurred. Being a publisher myself, it was a pleasant surprise to have the work and the philosophy in direct conversation. The crew of April Gloaming including illustrator, Whitney Proper. The portrait of the artist with her new book! From the ambiance, to the work itself, to the collective energy of everyone in attendance, I know that one won't soon forget such a moment for Kailey Tedesco. April Gloaming is a publisher worth supporting and boast an eclectic mix of work that you should check out. Below are some links for She Used to Be on a Milk Carton as well as April Gloaming. Until next time, thanks for reading The Weekly Degree! 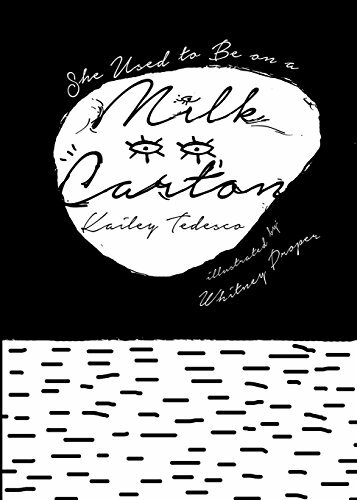 Kailey Tedesco is the author of two poetry books, She Used to be on a Milk Carton and These Ghosts of Mine, Siamese. Her poetry and essays all tend to focus on occult themes, witchcraft, gothic imagery, Catholicism, girlhood, kitsch, and confessional writings. She is most consistently inspired by David Lynch, Shirley Jackson, and the Lizzie Borden trials. She has been nominated for the Pushcart Prize, and her work has been written about in publications such as New Pages, Beach Sloth, and others.